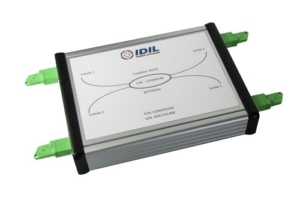 IDIL Fibres Optiques provides a wide range of robust fiber optic couplers with bulkhead connectors. IDIL Fibres Optiques offers fiber optic couplers following customers specifications: single-mode or multi-mode fiber type, connector style, wavelength, coupling ratio. Our products offer very low insertion loss as well as excellent environmental stability. IDIL Fibres Optiques couplers can be used to either split or combine signals at 1310 nm, 1550 nm, with 50/50, 10/90 coupling ratios. Other wavelengths and coupling ratios are possible. Do not hesitate to contact us. Compare to fragile fiber pigtails, our couplers are integrated into a compact and rugged packaging with bulkhead connectors. 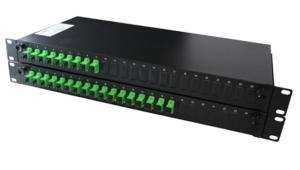 50/50 fiber optic couplers: split fiber optic light. 2×2 couplers: combine the light on one side and split it on the other side. 1×2 couplers: same as 2×2 couplers but the input fiber has been cut short.